I am currently immersed in the last few months of work completeing a hybrid illustrated novel. “Monkey Boy” (Scholastic 2014) is not a graphic novel or comic, but a hybrid of traditional novel and comic sections. As an author and illustrator it was a natural format for me to be drawn to as there are things that each art form does better than the other. But there are also things about each art form that really bug me. However, when I started working on this hybrid idea five years ago, I didn’t know that any such thing existed. In those five years (it’s taken me so long because I have too many other books to do) the art form has come a long way. In part one I’ll talk about some comic/novel background and in part two I’ll give you an exclusive glimpse into the world of my junior fiction hybrid novel “Monkey Boy”. I first encountered comics in the form of my dad’s Eagle annuals from the 1950s. These were a great source of entertainment when we visited my grandparents orchard in Twyford, Hawkes Bay. The artworks were (and still are) stylistic and sophisticated – especially the fantastic “Dan Dare”. And being post WW2, it was full of guns and violence with nary a hint of PCness. Eagle annuals were also my first exposure to the amazing Ronald Searle. The inside covers sometimes had one of his crazy scenes and, although I have never studied Searle specifically, those images must have had a subconscious influence on my work, especially the busy and crazy pages of my “Looky Book”. When I was about eight I discovered Footrot Flats, the wordless comics of Mordillo and the wonderful world of Asterix. The last has gone on to have a huge affect on my work. Not in style, but in the energy and action, the atmosphere and environment of Albert Uderzo’s art. One of the biggest influences have been the references in Asterix. The series pays homage to everything from popular TV shows, to Shakespeare and latin quotes, to famous events in history and great artworks. For me, this is something very important that keeps a book alive. As you get older you keep going back and discovering new meaning and appreciation of these books. It also helps keep parents enthused when reading over and over and over again – or just passing on their love of books to their children. This is something that I try to do in my work too. But not all comics are as elegant. Basically I find it’s largely an form where each artform is in competition instead of harmony. Humans are trained to follow the words and they flick over the artworks to get to the next line (unless you have a lovely panel like the one above). Meanwhile, incredible bulging superhero artworks try to outshine everything else on the page. I personally read the two art forms separately. First I read the story and then I go back and look over the pictures – which I find is an unsatisfying combination. I feel bad when I read a comic, as I flick over the pages and worry about the poor artist who spent a week painting one panel which takes me 10 seconds to glance at. There are incredible graphic novels – but like any artform, 90% is fairly average. Then we have a work of real brilliance like Shaun Tan’s “The Arrival”, where the comic format is allowed to unfold, without the need for words. In this book I find myself lingering on the images and it can take 15 minutes just to ‘read’ one page. So what about novels? I have to laugh when people claim that there is a NEW trend to put illustrations in novels. Pictures in chapter books have been around as long as the printing press. 100 years ago, some of my favourite artists like Arthur Rackham, Edmund Dulac and Maxfield Parish were doing incredible work on books aimed largely at adults – I have a gorgeous “Romeo and Juliet” illustrated by Rackham a century ago. Today the tradition of novels with chapter illustrations has been largely confined to junior and teen fiction. In the best of children’s books and comics, words and pictures work together to fill in the spaces left by the other artform – but for some reason, as we become more sophisticated and move up to junior fiction and teen novels the relationship between words and pictures gets dumber. My main problem is that often each artform repeats the other. That may be Ok when reinforcing words with beginner readers, but as a sophisticated art form I find it a bit shallow. In particular, I often find that English and American books have the strong hand of an art director telling the illustrator what to draw (usually something passive and inoffensive to the reader’s imagination). When I have illustrated novels I have pushed hard to inject something new in-between the lines of the text and capture some of the energy and action of the scene. In the last ten years we’ve had a zeitgeist moment – obviously many artists across the world have come to the same conclusion, myself among them, that putting large illustrated sections into novels is a really cool idea. Hybrid novels are often the work of author illustrators and I’ve been thrilled to discover the variety of forms they can take. 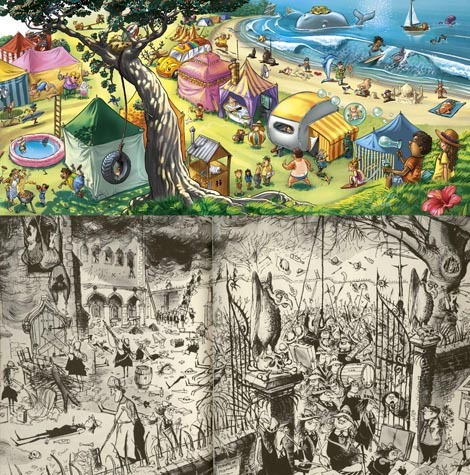 There’s Brian Selznick’s “Hugo Cabret” and “Wonderstruck”, where the novel and illustrations are clearly separated, allowing you to really ‘read’ the illustrated panels (as I mentioned with Shaun Tan’s “The Arrival”). 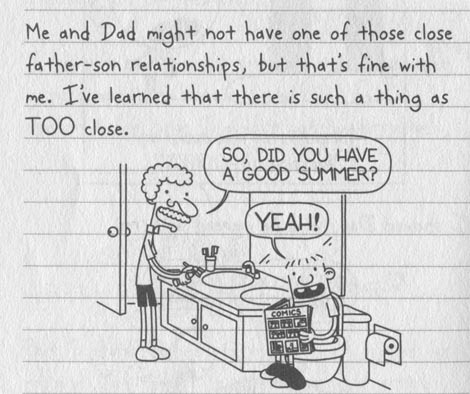 What about Jeff Kinney’s “Diary of a Wimpy Kid” – I love the simplicity of his line drawings and how he makes great use of the two art forms. Often the pictures tell you another story than how our narrator sees things as in this hilarious page from ‘Diary of a Wimpy Kid, Dog Days’. Chris Wooding’s “Malice” is a great concept when a group of teens are transported into a comic world, with these sections naturally told in comic form (although I think it is let down a bit by the artwork). My own work on “Dinosaur Rescue” with Kyle Mewburn has been a great experience/experiment. There is often a great merging of storytelling with words and pictures each filling in the other’s gaps. One of my favourites hybrids is by one of my best-loved illustrators – Chris Riddell’s “Ottoline” mixes perfectly a sparseness of words which are completed by his magical illustrations. It is something that I believe can only REALLY be achieved to perfection by a single author/illustrator, and there are many others out there. I’m thrilled that my “Monkey Boy” is being published by Scholastic as they are the natural home of hybrid novels (including several mentioned above). In part two I’m going to talk about my five years work on “Monkey Boy”, and what form I’ve tried to achieve.